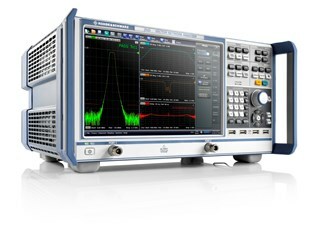 The R&S®ZND is a basic network analyzer covering the 100 kHz to 4.5 GHz frequency range (and can be extended to 8.5 GHz). It has a power sweep range up to 48 dB, an up to 120 dB dynamic range, and bandwidth coverage from 1 Hz to 300 kHz. This analyzer has been designed for versatility. It can be used to measure various parameters of an electronic network, as a unidirectional test set for measurements up to 4.5 GHz, or as a bidirectional test set for measurements up to 8.5 GHz. It features a powerful option for analyzing components like cables and filters in the frequency and time domain. The R&S®ZND vector network analyzer can be controlled remotely via LAN or GPIB to configure measurements and read results. It also offers a variety of digital interfaces that can be used to speed up automatic test cycles.